As we age, I think this is something that we hopefully learn through experience. Today, I hope you will begin to change that. Each time you look into the mirror I hope you will say, "I love you so very much". Because, you are deserving of love and love starts within. Please join us tonight for Women Speak. We will be talking about toxic relationships. Wishing you a wonderful day, Laura! Such wonderful advice Laura. Last night in bible study, we have twice a month in our home, the pastor (on video) said to "always shoot for par--go for whats important-don't worry what everyone else is trying to achieve. I thought that was extraordinary. That is great advice, Ann!! Good Afternoon Laura, I love today's words of inspiration. I think as women, we spend so much time, caring for our children, our husband, our extended family, that we don't have time to think about ourselves. 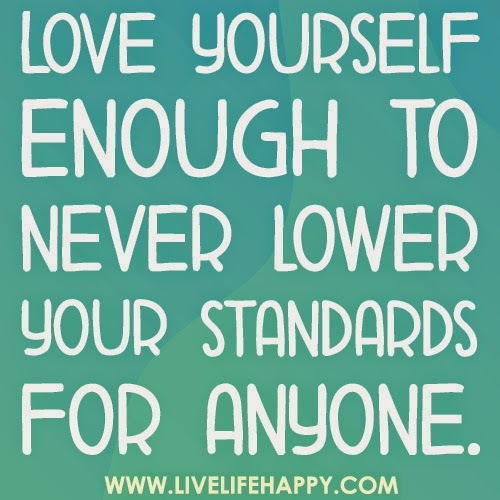 I am writing these words down and pinning them up on my noticeboard, so I can remind myself everyday that I don't need to lower my standards. it is alright to be me. Take care and warmest wishes. I think that it's good to love yourself first too, however not so much that you think you're better than everyone else. I have seen that trait in some people and don't like to be around them. They are self absorbed and arrogant. We must all keep our humility. When we love ourselves without feeling "better than" or "less than" others, it" frees us" to love others unconditionally.